Jibril Raymo hates stair-climbing machines. “They’re boring. They feel like you’re not going anywhere,” says Raymo, a former UCLA football player. 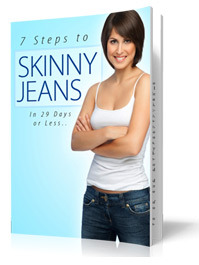 But to stay in top physical condition, he needs the abdominal and lower-body workout that stair climbing provides. So instead of trudging to nowhere in a stale, sweaty gym, Raymo runs up and down real stairs—170 of them to be precise. “It’s not like standing in one place,” says Raymo, as he catches his breath after his twelfth summit of the Santa Monica Canyon stairway. He takes a pull from one of the myriad water bottles tucked like so many mushrooms in the flowerbeds. “You get to the top and see the view of the ocean and the mountains. You feel like you’ve accomplished something.” And he has—those 12 roundtrips are a tougher workout than climbing up and down the Empire State Building. 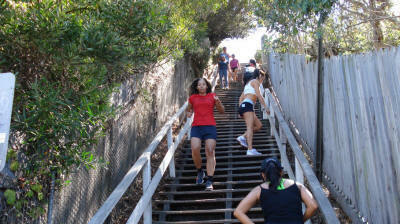 Raymo is just one of thousands of locals who’ve discovered that LA’s public stairways aren’t just a way to get up a hill; they’re also an excellent workout opportunity. Stair climbing can effectively strengthen all the major muscle groups in the lower body: the gluteals, the hamstrings, the calf muscles and the quadriceps. 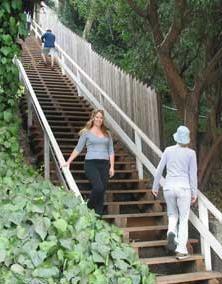 Stair climbing improves cardio-vascular fitness and can be an effective way to burn calories. In many respects, real stairs provide better exercise than climbing machines. “Doing actual stairs encompasses a wider range of motion than stair climbers,” says Jason Kozma, a personal trainer in Santa Monica. “You burn more calories because you’re working the hamstrings and the gluteus maximus,” two areas only minimally affected by the short range of motion on stair machines. And on real stairs, you can’t cheat by leaning on the machine. Stair climbing is especially beneficial for women who want to prevent osteoporosis. Bearing your weight against gravity and climbing stairs provides a very effective stimulus for bone formation. And it’s terrific for elderly people “because it prevents their lower-body muscles from atrophying,” says Kozma. In fact, just about anybody (except those afflicted with knee problems) can benefit from stair climbing. People of all ages and abilities adhere to the same basic etiquette: stay to the right, pass to the left. “For me, jogging it is dogging it,” says Rick Valdez, a 17-year-old senior at St. Monica High who sprints all the way up the stairway between Pacific Palisades and Santa Monica. Meanwhile, a 70-something couple keeps a slow and steady walking pace. Real stair climbing is environmentally friendly, too. No electricity is needed to power a machine. Sunny skies supply the lighting. And ocean breezes, not fossil-fueled air conditioners, do the cooling. Stair climbing requires no sophisticated equipment or expensive health club membership. The City of Los Angeles has nearly 200 stairways open to the public, according to the Department of Public Works. And they’re all free. “This is my gym,” says Marie-Claire Edouarzin, a chiseled make-up artist from Hollywood. Once a week, she drives to Pacific Palisades and climbs up and down 15 times. “I don’t like doing it, but it works fast,” says Edouarzin. For first-time stair climbers, sore quadriceps are literally a “down” side to working out on real stairs. Going down stairs as well as up them builds the thigh strength needed to brake yourself from falling—a benefit you just can’t get from a machine that only goes up. For them, Bryant recommends quad stretches like bending the knee back so that your foot touches your rear end. He also suggests stretching your hamstrings (stand on one leg and raise the other to a higher step) and calves (put the balls of both feet on one step and drop your heels below your toes) before any stair-climbing workout. Originally printed in Whole Life Times. John Rosenthal, a fitness writer in Santa Monica, takes the stairs instead of the elevator whenever possible. His work has appeared in Self, Shape, The New York Times, The Washington Post and The Los Angeles Times. Get Instant Access Now! Just enter your name and&email address in the box below.